Lovely small apartment of 35 mqs. for two persons with double bedroom, (is possible to add a free cot for one baby), angle cooking equipped with kitchen , refrigerator, microwave oven, toaster and kettle, and bathroom with shower. The apartment is situated to the plain earth of a building of 3 floors and is possible to use the building's terrace with sea view overlooking the island of Ischia and Capri, equipped with table, and lounge chairs. Free WI-FI Internet available. Sorrento Coast Apartment is situated in the nicest area of Sorrento Peninsula, a few minutes to Sorrento, in the little town of Massa Lubrense and is far just 300 meters (5 minutes by walking) from shops, grocery, supermarket bars and the characteristics restaurants where you can taste local food and wine. If you would like, car is not necessary to discover Sorrento and Amalfi Coast. From the apartment there’s a well linked bus transportation system. The bus stop is at 5 meters from the apartment At the house you’ll find the timetable for buses, ferry and train. Free public car parking at 20 meters. Beaches at 1,5 Km. Sorrento Coast Apartment is far just 5 Km from Sorrento Center. With the bus you can reach easily Sorrento Centre (bus run each 20 min - ticket euro 1.30) and railway station for excursions to Pompei (30 min), Ercolano, Napoli (1 hour), Roma or other location, Positano, Amalfi (1 hour). From Sorrento harbor there's direct hydrofoil to Capri (20 min), Naples (40 min) and Ischia (45 min). Met by friendly family, however apartment was bleak and not the cleanest. Roof terrace was lovely but six flights of stairs to climb. We thank our kind guests and respect their comments. We have always worked to make the holiday of our guests wonderful and all their comments have always confirmed it. We are very sorry for this negative comment on the apartment. It seems unfair because the apartment is well described, is furnished as seen in the photographs and we deliver it to guests always well cleaned. This was a lovely property but a bit more remote than I anticipated. Serena and Mario were very helpful. We warmly thank the guests who have enjoyed the accommodation, hospitality and the beauty of the Sorrento Coast Apartment. The tranquility and the centrality of the apartment make the stay of guests wonderful. Thanks for choosing us. Both host Mary & Serena were wonderful host. Very helpful in planning our trip to Amalfi coast via bus and boat trip to the Island of Capri(door to door pickup and return). You will never meet a nicer host! We will come back again. Thank you for choosing us, appreciating the beauty of the area and all our hospitality. We are happy to have made your holiday wonderful. Hope to see you again in our apartment for enjoy many nice sunsets overlooking Ischia and Capri island. Massa Lubrense a great place. Serena, Luigi's younger sister was a great host. This is a nice little convenient place to venture around the Amalfi coast and Capri. The boat trip, arranged by Serena, was great. Massa has everything you need for a true Italian experience. Sunsets from atop your accommodation were fun. Grocery stores in town, ten min walk, have good quality food and vino. We enjoyed that. We hope to return someday. Ciao. Thank you, we are happy that you enjoyed the accommodation and the area.The continue positive comments reward all our work. Hope to see you again in our apartment. Thanks again for choosing us. Thank you, we are happy that your vacation was wonderful. The positive comments reward all our work. We are lucky because the beauties of the Sorrento Coast and the Amalfi Coast always fascinate all tourists who choose it for their holidays. 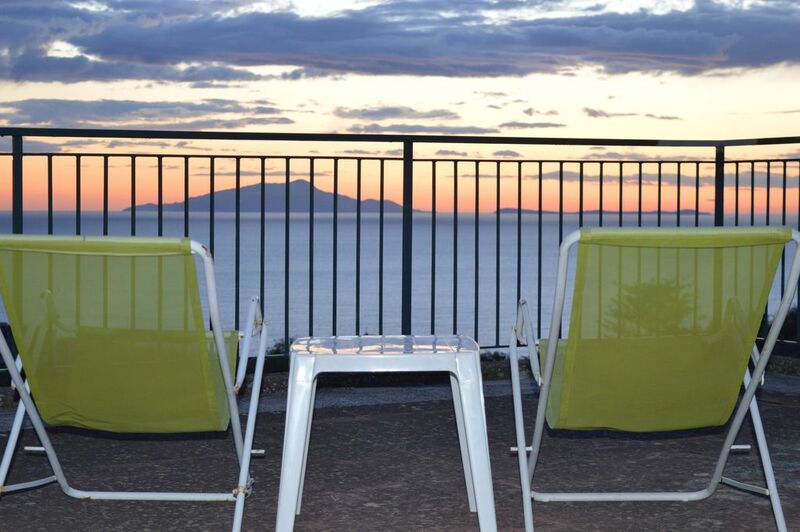 Hope to see you again in our apartment for enjoy many nice sunsets overlooking Ischia and Capri island. Thanks for choosing us. We, my daughter and I, spent 5 nights at Mary's place. We arrived Sunday evening and left Friday morning. It was easy to use the local bus to travel between Massa and Sorrento. Mary's suite is small but comfortable and has everything you could need. Mary and her family are very helpful. Serena and Luigi picked us up from the bus drop off in Massa when we arrived and helped with any of our concerns or questions right away. Mary's homemade lemonchello was a wonderful surprise. Mary's daughter, Serena was very helpful in ensuring we knew where things were and how to get there. Although there is no air conditioning, the open windows and fan kept the room comfortable. We really enjoyed our stay. We are happy that you appreciated "Sorrento Coast Apartment " because is the ideal place for a relaxing and charming holiday in Sorrento Coast. The apartment is situated in the nicest area of Sorrento Peninsula, a few minutes to Sorrento, in the little town of Massa Lubrense, an ancient village of fishermen and sailors. Central and sunny position, looking on a green garden between lemon and orange trees, at only 300 metres from shops, bars and the characteristics restaurants where you can taste local food and wine. There is a bus stop just 5 metres away and free public parking at 20 metres. Sorrento centre and railway station for excursions to Pompei and Erculaneum at 5 Km. Ideal situation for excursions to Positano, Amalfi, Vesuvio, Ischia, etc. You can taste our local typical kitchen whose culinary arts have been consolidated to international level from famous present restaurants on our territory. Sorrento Coast: Internationally famous and well known holiday resort with lovely view over the Gulf of Naples. Lots of restaurants, bars and shops. Boat trips to the Isle of Capri and along the coast with its pretty resorts of Amalfi, Positano and Ravello.